Hi Madlocals! Today I want to share with you some tips that will definitely upgrade your experience at Madrid to expert level. And, lucky you, all of them are food-related. First, I want to teach you something very important about the Spanish culture: food is not only for feeding yourself. At least in Spain! In this country, food is a very cultural feature. It is related with the sense of community, because food was meant as an excuse to meet with people and have a good time. It’s a bit of a ceremony or a ritual, because every food phase must be respected: starter, second and dessert. For example, in Spain is super weird to order coffee while you are eating. You must wait until the end! Finally, eating in Spain has a dimension of spare time too, because food is supposed to be enjoyed, even if you only have a 30-minutes break at your office. In Spain, nothing is as sad as eating a sandwich in front of your computer! As you may know, there are many good restaurants at Madrid. 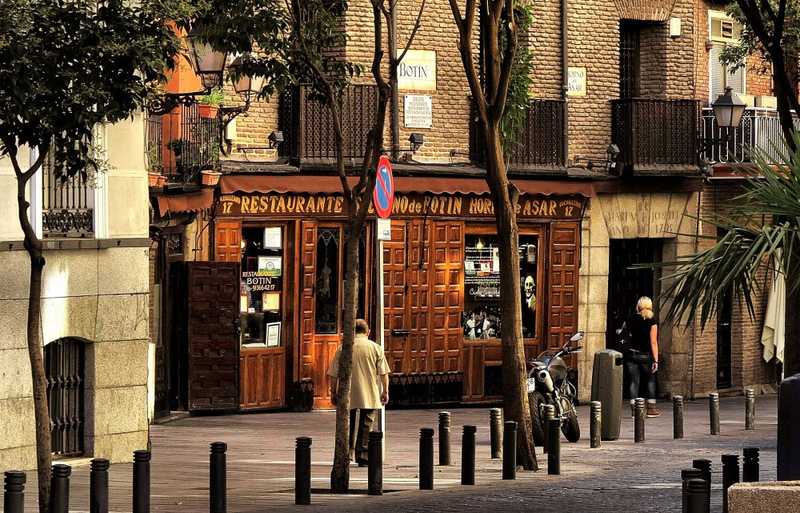 We also have the oldest restaurant in the world: Sobrinos de Botín. It’s so old that painter Francisco de Goya used to work there as a waiter when he was young! But there’s a pity about this restaurant: it’s plenty of tourists. If you want to get a more local experience, you may take a look to this short list of very traditional restaurants in Madrid. King Alfonso XIII married princess Victoria Eugenia (BTW she was Queen Victoria’s great daughter) on May 31th 1906. An anarchist threw a bomb to their carriage, causing 25 deaths and a hundred injured, including the king. Casa Ciriaco was already opened, and the king was taken there to be assisted by a doctor. There are pictures from that day decorating its walls at the hall, but the restaurant behind has a more picturesque decoration, plenty of pictures of old Spanish stars. #Madridhack If you don’t speak fluent Spanish, bring a dictionary with you. You’re going to need it. This place is even older: opened since 1892. Placed at the hipster neighborhood Malasaña, this old tavern offers you a trip back in time, also very good food. They serve one of the best tortilla in Madrid, but croquetas and salmorejo are very good too. #Madridhack: look at the walls for the Drinking contest. Winner results are hilarious (and a bit worrying). #Madridhack: after a fine lunch or dinner, you can go to La Bicicleta or La Realidad (two minutes away walking) and order a gin tonic to upgrade your experience. This restaurant has been famous for many years for its traditional style and its specialty in fish and seafood. Since 2016, it has become famous because Michelle Obama visited it (rumors said food really pleased her). I must say this is one of my Madrid top restaurants ever: everything in the menu is truly delicious! If I have to pick something, I would recommend boletus (mushrooms), chikpeas with prawns, octopus & squid rice, hake, cod, turbot or sirloin if you are more into meat. Last but not least, I want to talk about a live-changing meal which is very typical from Madrid. Its name is Cocido Madrileño. It even has a song! Chickpeas perform the leading role in this meal, which also include other vegetables, meat and chorizo. Cocido Madrileño is traditionally served in two alternative ways: with all ingredients together, or separated in three phases, which is the most popular way. Soup is served as first course. It’s made out of chickpeas and has noodles with it; sometimes is served with some chicken too. True traditional restaurants will serve it in a tureen or directly in the pot where it has been cooked and proportions must be generous, so each guest can have as much soup as he/she wants. Second course is what I like to name “the vegan option”, because it’s a big plate with chickpeas, carrots and potatoes, all of them boiled (Cocido literally means Boiled, so that’s the essence of this meal). It might also have cabbage, turnips and/or leek. Then the third course is immediately served, ‘cause is meant to be mixed with the second one. This is the “meat lovers” part of cocido: it has jamón, chorizo, chicken, veal, black pudding, fat and even marrow. There’s a place in Madrid that is considered at the Top One Cocido restaurants. Its name is Casa Carola and, pay attention, IT ONLY SERVES COCIDO. Don’t go with anybody that might don’t like cocido, because there’s nothing else at the kitchen! If you want something less radical, you can also choose La Daniela: there are four restaurants under this name which serve a very good cocido and have more options in their menu. Hope you find all these tips useful. Let’s enjoy Madrid as locals!